66.01% of the time, you spend $5,000 and get $15,000 and 100XP. So after 1,000 bets at 2-1 odds, you would walk away with $4,001,500 in-game cash and 80,005XP. 20% of the time, you spend $5,000 and get $50,000 and 150XP. So after 1,000 bets at 9-1 odds, you would walk away with $5,000,000 in-game cash and 70,000XP. 10% of the time, you spend $5,000 and get $100,000 and 250XP. So after 1,000 bets at 19-1 odds, you would walk away with $5,000,000 in-game cash and 70,000XP. 4% of the time, you spend $5,000 and get $250,000 and 500XP. So after 1,000 bets at 49-1 odds, you would walk away with $5,000,000 in-game cash and 68,000XP. So if you’re into in-game cash, your best bet is to stick to 9-1 or 19-1. But if you prefer XP, your best bet is to stick to 2-1. How do you bet at the Karts? Will you change your betting ways after this post? Would you prefer in-game cash via 9-1 or 19-1 or XP via 2-1? What stats or strategy related topic would you liked discussed? Share your thoughts. You know we love hearing from you. This entry was posted in Addicts How-To, Charts and Data, Safi's Stats and Strategy, Tapped Out, Tips and Tricks, XP Farming and tagged Betting, Go Kart Track Betting, How do I Get the Go Kart Track, Stats, Strategies. Bookmark the permalink. I always bet on the 49-1 car, for the amount of in-game cash I already get I don’t really care about this either, it’s just something to do lol. Like the Springfield Downs, I’ve never noticed a pattern to it, i’d say it’s just another well programmed algorithm that simulates chance, for example I’ve had times where I won’t win for a couple of weeks, then I’ve had times where I’ve won on the 49-1 car twice in a row landing me with $500,000 in a two days; but I’d say I win the $250,000 at least one to two times a month, though sometimes I won’t win anything for a while, but that always changes. I use the same strategy on the Springfield Downs, it pays out at least once or twice per month as well, from my experience the Downs win more often than the Go-Karts. I actually stored this. It doesn’t even look anywhere near like a track! Seeing how I never won the top prize on the dogs I imagine this would be similar if I did have it out and played it a lot. My go cart track doesn’t offer betting; only a cash payout. in fact, not until I read your post did I realize I was missing out. how do i trigger this? I did try storing it and then placing it back out into my Springfield but that didn’t do anything. Where did you get those odds from! They are programmed into the coding. I love math posts, so thanks for posting. 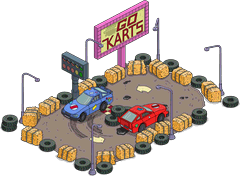 How do I get the Go Kart Track?! It was part of a mini-event, it’s not available right now.